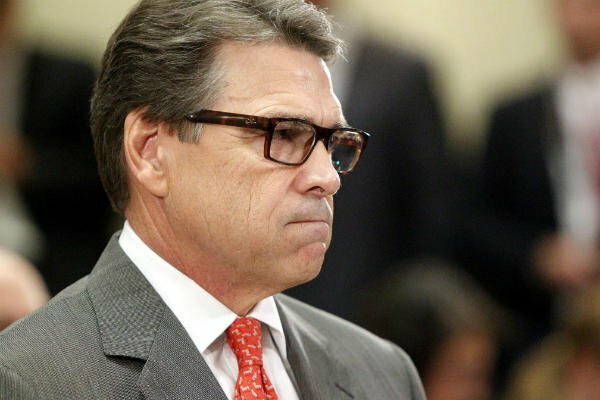 Oops – the mumbling, bumbling, Governor of Texas, Rick Perry, was indicted Friday by a grand jury in Travis County. The charges? – two felony counts accusing him of abuse of power, including making threats to his presumed 2016 presidential aspirations and potentially casting a cloud over the race to choose his successor. Perry’s response was not in line with his nerd-glasses he has been wearing of late, and seemed a little disheveled. According to his attorney, Perry is “outraged and appalled” at the indictment on one count each of abuse of official capacity and coercion of a public servant in connection with the governor’s veto of funding for the public corruption division of the Travis County District Attorney’s Office. Abuse of official capacity is a first-degree felony, carrying a possible punishment of five to 99 years in prison; coercion of a public servant is a third-degree felony, punishable by 2 to 10 years in prison. McCrum said he will meet with Perry’s lawyer and the judge to set up a time for the governor to appear in court to be arraigned. No date has been set. Tis was bound to happen eventually to Texas longest serving Governor. The man is not only a dunce that embarrassed himself and the rest of the state at the last presidential debate, but also has been increasingly overreaching in his actions as a Governor. And for all the people that were not granted pardons by you but deserved it – because they did not line your pockets or know your cousin were denied – this I hope they throw the book at you. If you are found guilty, of course. If not, you will remain fodder for comedians and anti-republicans for a bit longer. Sigh.